No need for suspense: this new 16.3 MP sensor is simply the best APS-C we have tested so far, sometimes able to compete even with very high-end full-frame cameras. The overall score of the K5 puts it in the lead with 82 points — more than 9 points better than the D90 or the Alpha 55, and 16 points ahead of the Canon 7D or 60D. The K5 is literally the best APS-C performer for each segment, even in low ISO. Dynamic range is clearly where the K5 struts its stuff. The scores it reaches at ISO 80 are simply impressive: at 14.1 Ev (print mode), even the D3X’s full-frame sensor is not that good. Smoothing appears at ISO 3200 but does not impact the metrics. 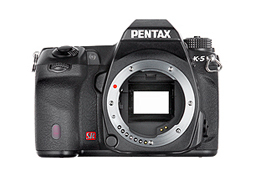 K5 vs D3x – Dynamic Range: the $1300 APS-C Pentax has a better dynamic range than Nikon’s $9000 full-frame flagship. K5 vs D90 – Dyamic Range: The APS-C sensor in the K5 surpasses that of the D90 and shows impressive figures between ISO 80 and 200. K5 vs Alpha 55 – Dynamic Range: the K5 is always at least 1 EV above the A55. K5 vs EOS 7D – Dynamic Range: at ISO 100, the K5 is above by 2 EV, and stays ahead by almost 1 EV all across the range. The biggest weakness for the K7 was its average high ISO performance. The K5 addresses this by reaching a solid 1162 ISO. K5 vs K7 – SNR: The difference is obvious — and consequential. For a 32 dB result, the K5 can climb to ISO 800, while the K7 stops at ISO 400. The K5 still shows a very good SNR at ISO 1600. While the K5 may be the best APS-C competitor, its excellent “small” sensor does not manage to close the gap with the good 24×36 models in area where size still matters. As good as it is, the K5 sensor isn’t still quite up to its solid full-frame competitors, being roughly one stop behind a D700 or a 5D MkII. But just imagine how promising the K5 technology could be in a full-frame body: increased picture quality associated with solid high ISO performance —a dream! K5 vs D700 – SNR: the best APS-C sensor versus a strong full-frame. ISO 3200 on a D700 gives the same SNR value as 1600 on the K5.